The Galway Nature Preserve contains about 2.5 miles of trails and is made up of ~49 acres of conserved forest, wetland, and pond habitat in the Town of Galway, New York. 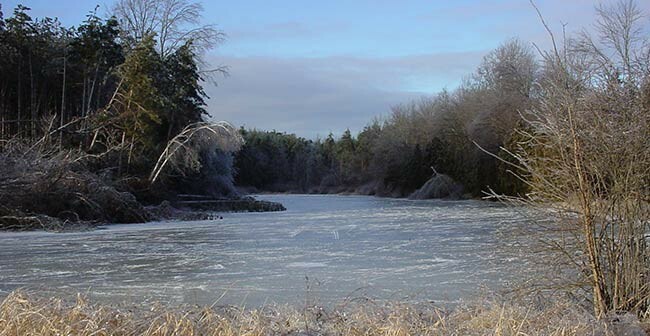 Now used as a public resource for nature study and outdoor learning, the property was originally donated in 2005 by the late Marshall DesRoches, who wanted to ensure that the land would remain forever wild and accessible to the community. Up until the late 1950s, the land was cleared and used for agricultural purposes. The property was later converted to a Christmas tree plantation by the DesRoches family. Many of these pine and fir trees still can be seen today, and make up a large part of the property’s rich forest. Along the trails that meander through the property lie remnant structures built by the DesRoches, including a small wood cabin, an old stone fireplace, and garage. Please use caution around these areas, as they are important to the property’s history. From exit 13S off I-87: Take Route 9 south. Take the first right onto Malta Avenue/Route 63 and drive about 1 mile until you reach Northline Road/Route 45 on the right. Stay on Northline Road for about 8.5 miles. After passing Armer and Bliss Roads turn left onto Jocky Street/Route 52 South. After 1 mile, take your second right onto Crane Road. The Galway Preserve is on your right at the intersection with McConchie Road. Saratoga PLAN would like to extend its thanks to all of the dedicated volunteer land stewards that have helped over the years in contributing to the creation and maintenance of this special place.